WHY HE TURNED ON THE SUN: A Throwback Tale About the Beginnings of Solaric Corp.
“We ran a little experiment on how to run an air conditioner without using Meralco power,” says Mike De Guzman, President of Solaric Corp., when asked how the Philippine solar power equipment company began. Mike was the chemistry lab geek in high school, who was known to accidentally blow up the science project by creatively mixing substances in quantities that would definitely result in an epic blast. He went on to business school in California for college, while his parents were imagining their son becoming an investment banker of some sort. During his final year in business school, a fire erupted and gutted their house. Mike then had to learn about construction and construction management, as they rebuilt their residence in Northern Cali. It’s true — challenges build character and necessity is the mother of invention. As the rolling blackouts of the 90s ensued, Mike learned to assemble a generator from a dynamo he purchased in Chinatown, with a Yanmar diesel rice thresher motor that had truck fan belts linking it together. As he began to understand the art of building homes, he embarked on a career in real estate development. This proved to be far more profitable than working for corporate America as a fresh college grad. Thus, in his early 20s, Mike built houses and supervised large work crews of American contractors. Passion never dies. His mind never stopped exploring DIY projects, which ranged from modifying cars to assembling computers. Other interests involved sports and adventures, including scuba diving, downhill skiing, white water rafting, back wilderness trips, and driving insanely fast motorcycles for 300 km+ excursions to unsafe limits. Mike started analyzing energy costs in running their call center. He discovered that energy costs often exceeded rent, and was almost approximately the same amount as their salary and wages expense. As he indulged in further research in power, he realized that the entire nation was actually paying way too much for power. 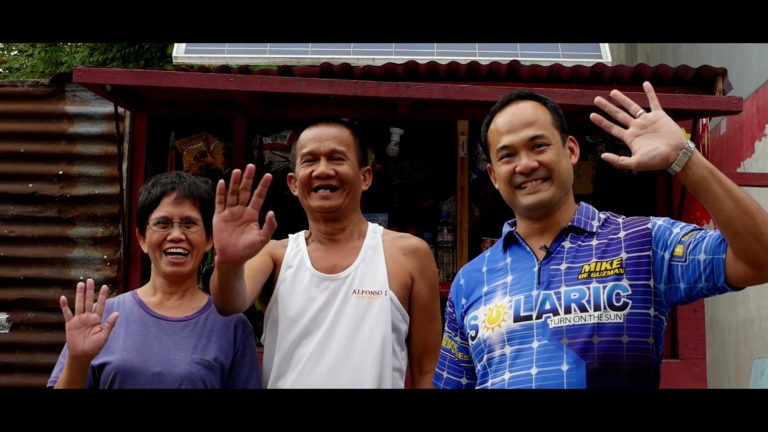 That triggered his interest in power conservation in the Philippines through solar power equipment. As soon as they touched back down on Philippine soil, Mike and Jade incorporated Solaric. The rest was history. For more information, please visit www.solaric.com.ph or email us at info@solaric.com.ph call 5040092 or 09178603141. We will gladly explain to you how the system works, or schedule a survey, so we can give you options for your new home or existing homes or businesses. At Solaric, we Turn on the Sun.